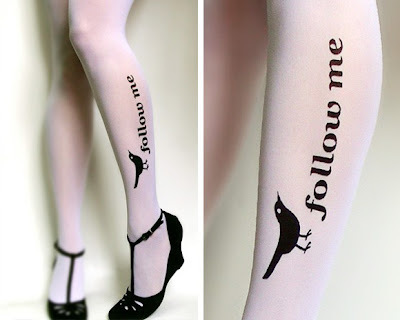 A cool and interesting collection of stockings that will look great on your feet. Les Queues de Sardines's Stockings: These creative stockings are screen-printed by hand in limited quantities and are known for their original range of unconventional and unique graphic style. Follow Me Twitter Stockings: These Follow Me Twitter tattoo thigh-high stockings are available at Etsy shop post.